The intersection count will be returned in the message window and can be used in a model or script to establish preconditions for subsequent operations. This tool determines the points of intersection in 3D Euclidian space. 2D line features are not supported by this tool, but 2D line features with height definitions stored in an attribute field can be converted to 3D by using Feature To 3D By Attribute. LINE_OID—The OBJECTID of the original line along which the intersection was found. MPATCH_OID—The OBJECTID of the multipatch which intersected the line at this location. DIST_3D—The 3D distance along the original line at which the intersection was found. LINE_OID—The OBJECTID of the original line from which the new line was derived. FROM_MP_ID—The OBJECTID of the multipatch feature that intersects the beginning of the line. A value of -1 is used to denote that the beginning of the line is not a point of intersection. TO_MP_ID—The OBJECTID of the multipatch that intersects the end of the line. A value of -1 is used to denote that the beginning of the line is not a point of intersection. If a line does not intersect with a multipatch, it is directly copied to the output and its FROM_MP_ID and TO_MP_ID fields will contain -1. DIST_3D—The 3D distance along the original line at which an intersection was found and which represents the beginning of this new line. LENGTH_3D—The 3D length of this new line. The sum of the lengths of each new line derived from an original line will be equal to the 3D length of that original line. Attribute values from the original lines can be referenced in the optional output features through the use of output line feature class through the Join Attributes parameter. The line features that will be intersected with the multipatch features. The multipatch features that the lines will be intersected against. The input line feature attributes that will be stored with the optional output features. IDS_ONLY — Only feature identification numbers will be stored. This is the default. ALL —All attributes will be stored. 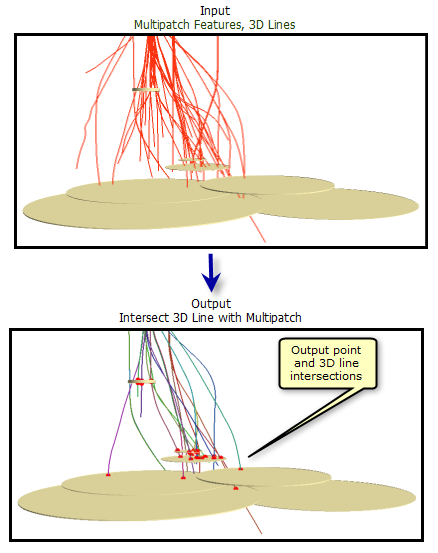 Optional features that represent points of intersection between the 3D line and multipatch. Optional line features that divide the input lines at each point of intersection with a multipatch feature.